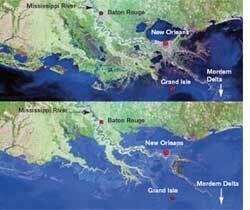 THE Mississippi delta in the US is going under the sea. Twenty-five per cent of the wetlands associated with it have been lost to the ocean. Between 1976 and 2006 the river deposited 205 million tonnes of silt every year, when 230 million tonnes were needed to maintain the delta. Steadily rising sea levels are only eroding it further. Geologists Michael Blum and Harry Roberts of the Louisiana State University in the US analyzed data on rates of sediment deposition in the Mississippi delta for the past 12,000 years. They found that due to an overwhelming surge of meltwater from the last ice age the oceans had filled up fast. This led the Mississippi delta plain to retreat inland. It was only after the rise in sea level had slowed down considerably that the delta grew seaward again. But this time there might be no going back.Human tinkering such as building embankments, dredging channels and cutting canals through marshes, has decreased the sediment depositing capacity of the river by 50 per cent. The drainage basin of the roughly 3,782-kilometre-long river includes about 40,000 dams and embankments built over the past century. At this rate an additional 10,000-13,500 sq km of the wetlands buffering New Orleans would be submerged by 2100, said the team. And since the sea level is rising at least three times faster than during the time when the delta-plain developed, even if sediment loads are restored, drowning is inevitable. The study was published online in Nature Geoscience on June 28. The Sunderbans delta in India is facing a similar problem. "The growth of the delta has stopped since 1995. It has, in fact, started receding," said Pranabes Sanyal of the oceanographic studies centre in Jadavpur University, Kolkata. R K Barman of the Calcutta Port Trust Officers' Association said adequate silt is not coming down to feed the delta as it gets accumulated at the port.